Your yard is a flat plain of snow now, but are you dreaming of a warm spring with beautiful flowers, blossoming trees, and handsome hardscaping? Get on the way to making your dream a reality, plan your landscaping now so you can get to work come spring! Before you even start your planning you need to take a measurement of your property. If you’ve had a survey of your property done you can use those numbers, if not you can generally find it as a matter of public record. Sometimes you can find the information on your plot’s dimensions online, other times you may have to go to the courthouse or city hall to find the information. With the measurements in hand, draw out the extents of your property to scale on grid paper, or using software. Then you plot the position of fixed items on the property, those things that you can’t or don’t want to move around, like your home, driveway, or trees. Add a compass rose to show the cardinal directions, that way you can know what directions to expect sunlight form, and where shadows will be formed at various times during the day. Next, make multiple copies so you can play around with multiple designs in the next step. Take the copies of your property and start playing around with different designs on them. Don’t worry about the little things like shrubs, and individual flowers in flower beds, not at first. Get the placement of major objects, like trees, patios, walkways, and flower beds first. Consider the traffic patterns that different objects will make in your landscaping. You might want to place patio’s or walkways in areas where you can expect a lot of traffic, like a pathway from the sidewalk to your front door, or a path from your patio to the gate in the back of your fence. Once you’ve ironed out the big things, you can move onto the little details. Make sure in all of the fun that you don’t forget important but boring things like lighting, irrigation, drainage, and where you’ll run electrical lines or water lines. Once you’ve found a design you like, and gotten all of the major considerations ironed out, it’s time to make your final plan. Use drafting tools to make sure your drawing is as neat as possible, and that everything is clearly defined. Use color, clear symbols, and labeling, to make sure this final copy is legible. 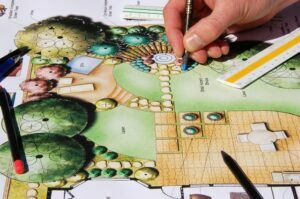 Coloring the final plan with colors like those that you will use in construction will help you visualize how the different colorful elements will tie together. Clear symbols and labeling will help avoid confusion between you and your landscaper, so that when it comes to making a flower bed with red mulch, you don’ accidentally get a red brick patio. Finally, discuss the plans with your landscaper, and make sure that they understand the entirety of the design. Don’t consider yourself a creative type? The Atlantic Maintenance group can help plan your landscaping. Call the Atlantic Maintenance Group. The Atlantic Maintenance Group is a full service landscaping company, providing landscaping design, construction and maintenance, as well as snow removal, asphalt and concrete services. This entry was posted on Thursday, February 19th, 2015	at 3:00 pm	and is filed under Landscaping Design	. You can follow any responses to this entry through the RSS 2.0	feed. Both comments and pings are currently closed.